In the Lausanne Covenant under the title ‘Wanted: Humble messengers of the gospel’ the following points were made in its analysis of missionary humility. First, there is the humility to acknowledge the problem which culture presents, and not to avoid or over-simplify it. Secondly, there is the humility to take the trouble to understand and appreciate the culture of those to whom we go. Thirdly, there is the humility to begin our communication where people actually are and not where we would like them to be. Fourthly, there is the humility to recognize that even the most gifted, dedicated and experienced missionary can seldom communicate the gospel in another language or culture as effectively as a trained local Christian. Authentic Mission must neither be swashbuckling nor triumphalist. During the great missionary enterprises of the 19th Century this was not always the case. Mindsets of 'West is Best' and grand goals of building up empires for their church were often found among them. This often reflected the Colonialism of Britain and other European nations at the time. Sadly this spirit is still seen today in evangelists and preachers who come across in an arrogant or proud manner. In their fervour to build up their own organization or church they frequently leave those who listen to them feeling both spiritually and financially exploited.Others make promises of health, wealth and power but when the problems arise or the promises are not fulfilled they are not there to help them. The offer that if you come to Christ 'all your problems will be solved' or the use of psychological techniques on people in order to induce them to become Christians, or at least join their brand of Christianity, are all unworthy of the true Christian Mission. Likewise preachers drawing other Christians away from their own churches with the enticement that they will become part of God's elite, or where God is moving, likewise bring dishonour to Christ. Yet even in modernity there were many examples of authentic missionarys. Men such as William Carey, Hudson Taylor, Sadu Sundar Singh to name a few among thousands were truly humble servants of God. They never exploited: They more often than not gave up their lives. 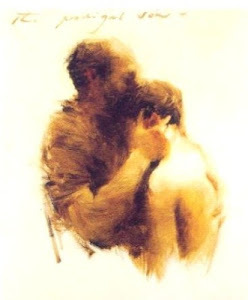 They truly loved the people, living among them ( see blog on incarnational mission) in a spirit of humility seeking to bring them the word of Christ in the context of the culture. This was often at great cost to themselves and their families. Many of those who went into all the world to bring the good news never returned, often dying within the first year. Jesus came as a servant and to give up his life for many: authentic mission requires that we do the same. An innovative approach to evangelism has been tried by Ikon the Belfast postmodern community ( Ikon) which they call the Evangelism Project. It has much to commend it as it resists the temptation to come across in a superior manner but rather encourages an approach which is humble and one which is also prepared to listen and learn. 'In this way an evangelist can be understood as one who is open to God at all times and encourages others in this way of being, thus helping to produce a clearing within which God is free to give God. In the gospels Jesus was more often hardest on the religious leaders than he was on the ordinary man and woman.People do not have to listen to us and we need to have the attitude that they are doing us the favour by listening to us, not the other way round.Humility and servanthood and love should be the marks of those who want to share the life of God. The famous missionary E. Stanley Jones founded what he called Round Table Conferences which became known to the world through his book 'Christ at the Round Table'. His attitude towards evangelism was similar to that of Ikon. The approach to evangelism by Ikon has much merit in it especially in regard to its humility and servanthood. Many missiologists however would probably regard this approach more as either 'pre-evangelism' or a facet within 'Presence Evangelism', that of living the life of Christ without actually proclaiming the gospel in the traditional manner. The approach by Stanley Jones towards those of other Faiths ( be they Hindu, Muslim or Buddhist) where they each shared their experiences of the divine, was much deeper than mere 'Dialogue', that of discussing propositional truths. It was being honest and vulnerable together. It was also at these Round Tables that many came to experience, then follow the risen Christ. As regards strangers or visiters who come to our meetings or gatherings we should go out of our way to make them feel welcome. They should be seen as our quests. It is a sad fact that many churches and fellowships be they evangelical, charismatic or postmodern show a lack of hospitality and friendship towards outsiders. People will not care how much you know until they know how much you care.I'm sure all of us have gone into a place where we were made to feel invisible or even a nuisance. It's not a nice feeling.We should therefore see it as a crime when we do it to others.Postmodern people care less about whether a religion is true or not, but what they do want to know is whether it works. Remember how St Francis who kissed the hand of the leper: Are we not even prepared to walk a few feet to talk to a stranger who is alone, or looks a little uncool,or strange. Many miss out on lasting friendships by not making a little effort and being friendly to the friendless person. 'Whatever you do on to the least' says the Master 'you do it on to me'. This is especially important for postmodern people who are looking for something real, something authentic. Anyone can put on a show of religion or spirituality. We can have the talk but not the walk but at the end of the day it's all sham and we have only fooled ourselves. It should be noted that when I speak of Christianity or someone being a Christian I am not talking about someone who has joined a Cult (A group that practices religious ritual), or merely believed a Creed ( be it the Westminster Confession of Faith, The Nicene Creed or even the Bible), or even one who follows a Code of Conduct ( be it the Golden Rule, Sermon on the Mount etc.). Rather, it is someone who who has come to know and serve the living Christ. That means walking with Christ as our friend, trusting him as Saviour and following Christ as Lord. It is his life within us that we must nurture. It is listening attentively to His voice and seeking to do His bidding. If you don't know him yet as your personal friend, Lord and saviour you can do so. He still speaks to men and woman today as he did 2000 years ago when he said : ‘Behold, I stand at the door and knock. If anyone hears my voice and opens the door, I will come in to him and eat with him, and he with me'. He stands at the outside of each heart and life. He will not force his way in by kicking in or breaking down the door. The handle is in fact on the inside of the door. The decision is with us. Will we open the door? AGAIN TRUE-BUT WE DON'T WANT TO SPEND THE TIME LEARNING ABOUT IT. TRUE WE NEED HUMILITY BECAUSE_WE THINK CAN DO BEST BECAUSE OF OUR PROUD HARD HEARTS.